You can learn a lot about someone by spending some time together in the kitchen: some folks happily throw their carrots into the juicer without a peel or a rinse, while others nervously hose down their oranges with expensive cleaning sprays. But which of these generalized hypotheticals is the right way to go? Like with most things, there's a happy medium when it comes to washing produce -- although you may want to err a bit more on the "clean freak" side of things. We asked agriculture and food safety expert Marisa Bunning to explain why the hell it's so important to clean our fruits and veggies in the first place, and how to do it without going insane. Why can't we just be lazy and skip the sink? It's a common misconception that washing produce is about getting rid of the pesticide residue, like that shiny wax on apples or those suspicious white flakes on oranges that everyone's so confused by. Truth is, pesticide on produce falls within allowable levels most of the time, although it may depend on what produce we're talking about and whether it's coming from overseas. "The greater concern is with pathogenic microorganisms -- which can be bacteria, viruses, or parasites," Dr. Bunning explains. 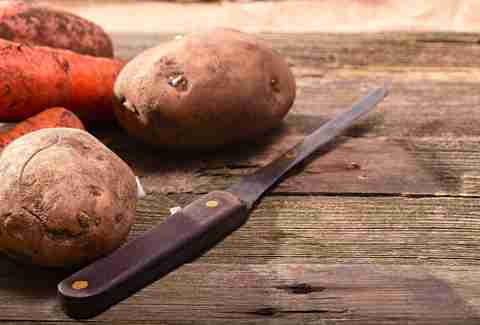 "A high number of foodborne illness outbreaks have been attributed to fresh produce because there are so many opportunities for contamination in the growing environment and after harvest." Where do these damned microorganisms come from? Thinking about the "farm-to-table" path of your broccoli, you have to consider the soil it was grown in, the water that was used, how it was stored, transported, and handled in the grocery store, with potential for contamination at every step of the way. If you're one of those five-second-rule naysayers who washes an apple a little longer after dropping it and watching it roll along the unwashed kitchen floor... don't kid yourself. You have no idea where else it's been. What exactly happens if you eat contaminated produce? The microorganisms that could be on your food can do anything from cause you to have a bit of stomach pain to make you die (isn't that comforting). If you look up lovely-sounding infections like salmonella, E. coli, listeria, cyclospora, and hepatitis A, you'll get a sense of which end stuff will fly out of, and even learn how some of this stuff can cause you to be chronically ill. Three cheers for perpetual diarrhea! What's the probability that we'll get one of these nasty illnesses? "These types of questions are harder to answer -- it's impossible to quantify risk because there are so many variables and unknowns," Dr. Bunning tells us. Because much of our food supply in the US comes from large operations, when food contamination happens, it becomes a big deal: consider the recent 2015 cucumber salmonella outbreak that affected 27 states, or the cleverly named "sproutbreaks" that happen essentially every year. Shouldn't something be done about this?! In an ideal world, yes. "It's best to prevent contamination in the first place," clarifies Dr. Bunning. "The passing of the Food Safety Modernization Act is bringing about changes that should help ensure safe handling all along the food chain." That act was passed in 2011, though, and people are still getting food sick -- implementation is underway, but you also have to fend for yourself. "Washing is a simple practice that can help reduce the overall risk of illness," Dr. Bunning recommends. How do you wash produce effectively? Right before you use produce (not when you bring it home), wash it in cool running water. 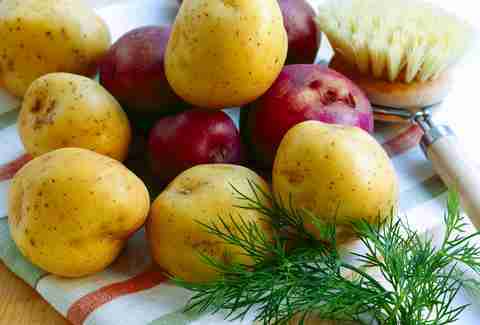 The rule is either to rub (for soft-skinned fruits and vegetables) or to scrub (for hard-skinned ones). Using a produce brush for hard produce is definitely recommended -- but please don't go scrubbing nectarines and blueberries or anything crazy like that. As for those pricey veggie-wash sprays, keep your money: the FDA specifically states that these aren't necessary (and may just mean you're ingesting unnecessary chemicals). 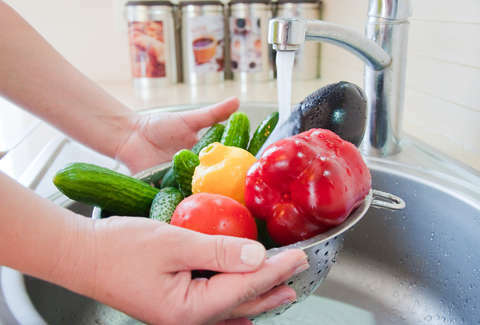 For your convenience, Dr. Bunning and her team at Colorado State Extension have actually put together a handy guide on how to wash everything from leafy greens to hot peppers. I don't have to wash bananas too, do I?! Sorry, but you do need to wash bananas. It may feel silly, but the truth is that, like all other produce with non-edible skin (oranges, avocados, cantaloupe, etc. ), bananas should absolutely be washed. Bacteria and other microscopic threats can get transferred from the outside of the skin to the part of the fruit that you're eating, either when you cut it or when you open it with your hands. The only thing you don't need to wash is "washed and ready-to-go" or "triple-washed" bagged lettuce -- why it's washed three times and not two or four is beyond us, but it's officially good to go. So there you have it: washing produce is officially the way to go. But please don't get overwhelmed and stop eating fruits and vegetables altogether -- they're still super good for you, and well worth the extra trouble. Marina Komarovsky is a freelance writer for Thrillist, and she's always thrown off by fruit baskets at continental breakfasts. For more on food and nutrition, follow her tweets: @MariKomarovsky.